At almost every home inspection with a sump system, I end up recommending some type of change for safety, performance, or both. 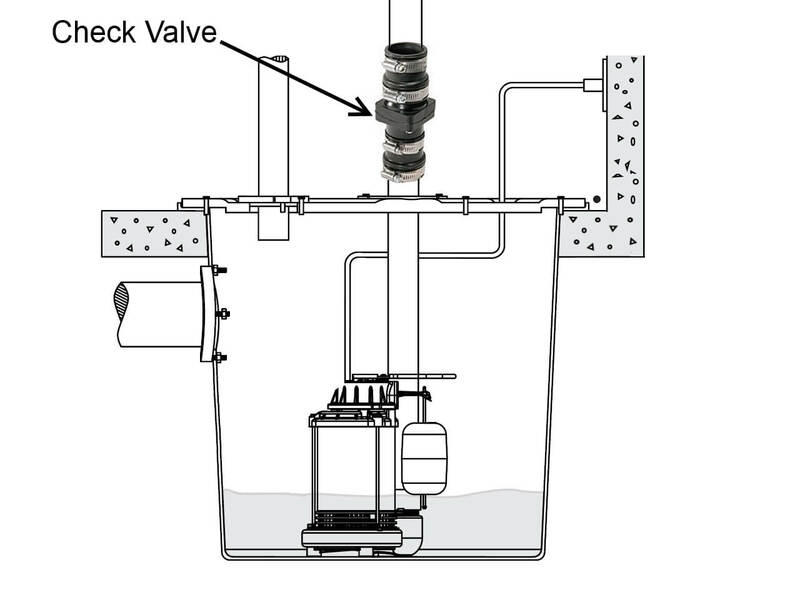 Here are five common sump system defects, in no particular order. This is a safety issue because a small child could drown if they fell in to a sump basket. The fix for this condition is quite simple; if there’s no cover, install one. If the cover is loose, get a few 3″ drywall screws and run the screws right through the cover in to the sides of the sump basket. A good rule of thumb is to also make sure the sump cover can support someone’s weight, for obvious reasons. Ideally, the sump cover should also be airtight. This will help to prevent radon gases from entering the home, as well as moist air. 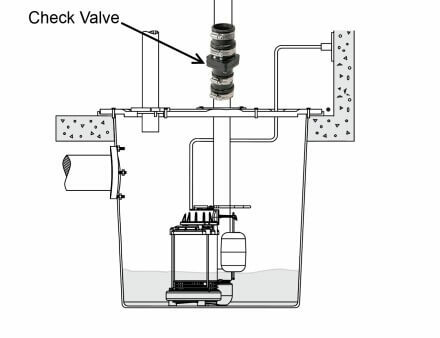 A check valve should be installed on the discharge pipe to prevent water in the discharge tubing from dumping back in to the sump basket after the pump shuts off. This is also a simple fix; check valves cost about $10 and are easy to install. 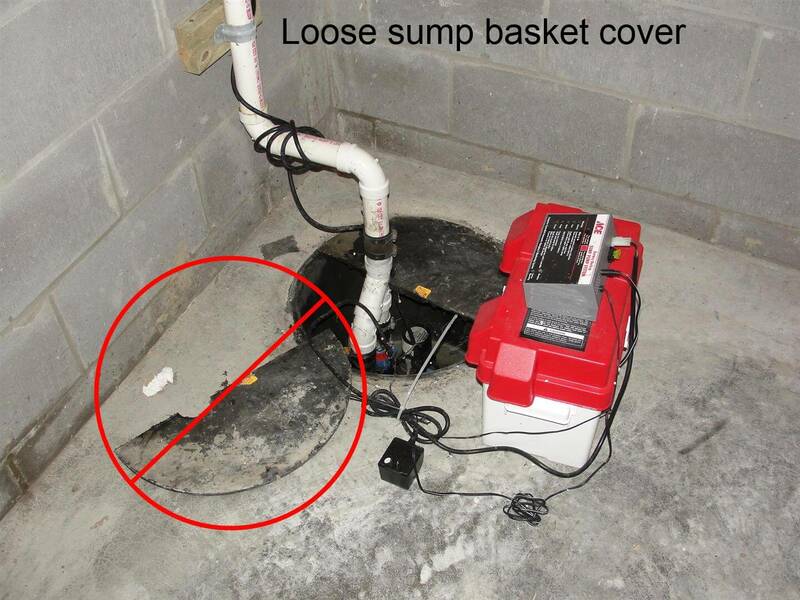 Sump pumps typically have a 1-1/4″ or 1-1/2″ outlet. 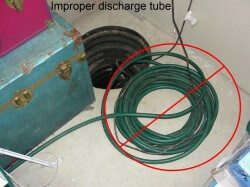 The size of the discharge tubing should match this; that means don’t use a garden hose. Using undersized discharge tubing, even at the exterior, will force the pump to run longer each time it turns on, decreasing the life of the pump. Some smaller pumps may come with an adapter for a garden hose, but those are the exception. The fix for this condition is simple; use larger tubing. Inside the house, use ABS or PVC tubing. Outside the house it’s not nearly as important. Home improvement stores sell 25′ lengths of corrugated tubing for under $10, and connecting these is a piece of cake. 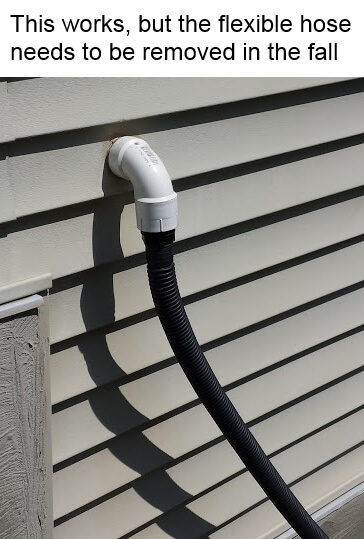 When a sump pump discharges water right up against the house at the exterior, where does the water go? Right back down in to the sump system! While this might seem to be extremely obvious, experience has told me that it might not be, because this is a very common defect. 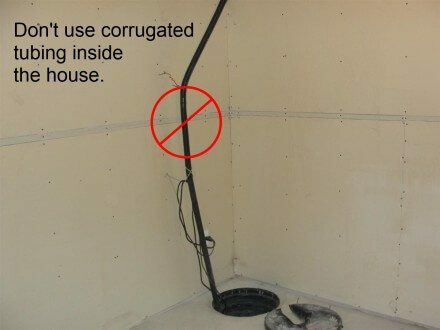 The discharge tube from the sump system should terminate at a point where the water will drain away from the building. I’m embarrassed to say that I actually had this happen to me last year. I typically remove my discharge hose at the exterior in the fall, but I forgot to do it last year. Water ended up freezing inside the tubing, completely blocking it. One morning I noticed a low humming noise that never stopped, and I found my sump pump running continuously, unable to pump the water out. I can only imagine how long the pump had been running before I found out about it, and how many years of service this stupid mistake might have removed from my pump. While disconnecting the drain hose at the exterior will prevent the sump discharge from being blocked by ice, there’s another way to prevent blockage that doesn’t require any maintenance. 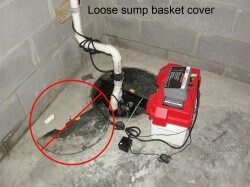 Simply have the sump pump discharge to an air gap. This way, if the discharge tubing fills with ice at the exterior, water will still make it’s way out. 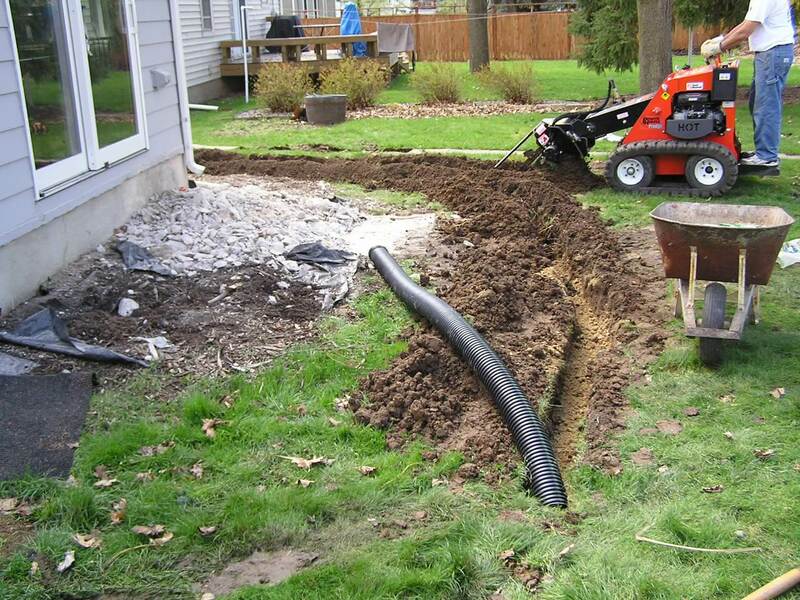 It will end up discharging right up against the house if the tubing is frozen, but it’s better than not discharging at all, and the amount of water that a sump pump pumps during the winter should be minimal. 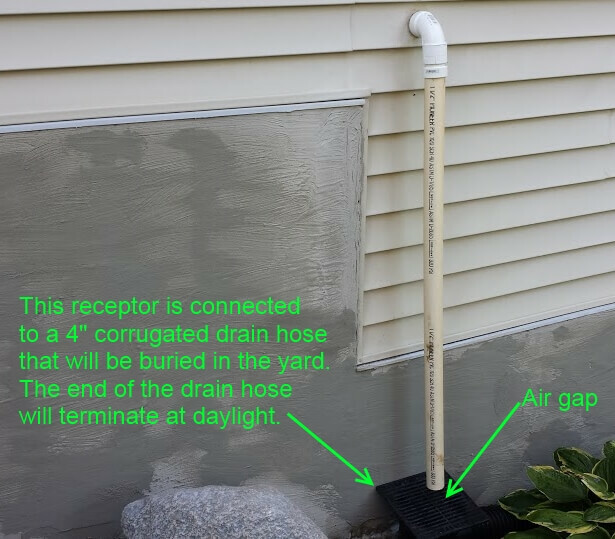 The photo below shows the sump pump discharging to a receptor that connects to a 4″ corrugated drain hose. Just be sure to significantly increase the size of the drain hose if going with this method; if the drain hose isn’t large enough, water will overflow very quickly. Next week I’ll discuss discharging a sump pump into the sanitary sewer. What are the dangers that come with freezing at the exterior? Especially when you leave it at that for quite a stretch of time? If the discharge hose is filled with ice and the pump runs, the water won’t discharge. The pump will just keep running, possibly overheating and failing. Real question to ask is why water is getting frozen in the line. Something is wrong on the other end that it gets surrounded with water and frozen up. It depends on your setup. If you are in a city or place that has storm drains to the road, you should be able to connect sump pump solid all the way out with no problem. But I don’t believe you’re allowed to connect downspouts to storm drains though.